that bears her name with cattle from Atanasio Fernández and Conde de la Corte. Brief chronology of the brand’s origin. 1949.- Mr José Castellano, Duke of Eustaquio Parrilla divided the livestock into two lots for his children Julián and Antonio, the lot of Antonio being sold to Mr Pablo de la Serna Gil, with the primitive brand and mark. 1963.- Mrs Pilar Sánchez Cobaleda acquired the livestock, changing the brand, eliminating the latter and merging it with the cattle of Atanasio Fernández. 1971.- The livestock was acquired by the Countess of Donadío, who also changed the brand. 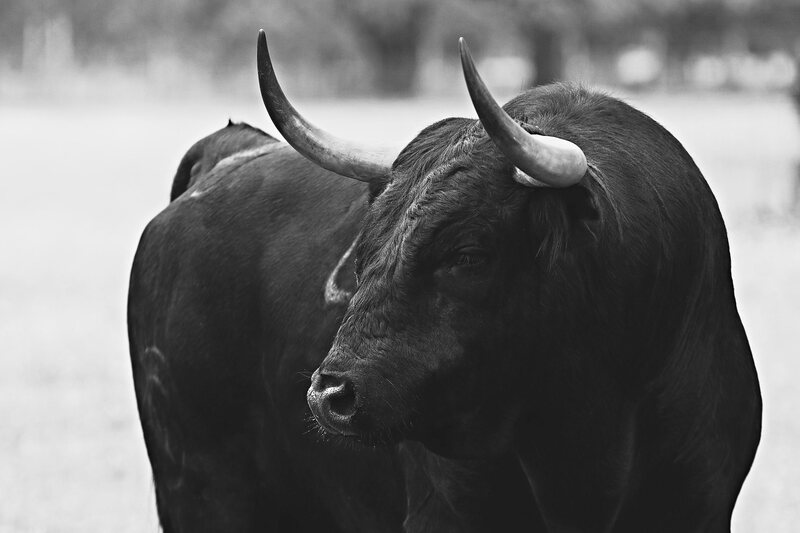 1977.- Mrs Dolores Aguirre acquired the complete lot of cattle along with the brand. 1979.- Mrs Dolores Aguirre acquired a stud named Ali and another named Tamaris from the Conde de la Corte. Breeding: Atanasio Fernández-Conde de la Corte. Coat: The coats are mostly black and only rarely appear in reds and browns. In specific and accidental cases, coats may more commonly appear as bragado, meano, spotted, striped, chorreado and the classic burraco. Type: This corresponds with that of its Atanasio Fernández origin, although with the imprint left by the studs of Conde de la Corte. They are mediolíneos and eumétricos bulls, altos de agujas with further development of the anterior third, or rather, leonine. The head is of medium size, with well-developed horns in terms of length, well-shaped veleto horns, with plenty of thrust. The neck is long and very fleshy, although over time it develops further. The rump is generally well-formed, but sometimes small. Extremities are strong and long. In recent years there has been a clear attempt to reduce the height and thinning of this breed in favour of a more symmetrical composition.